It’s a rally cry for masochists and a celebration of those that Darnielle has described as the most downtrodden members of society: drug addicts, the mentally ill, and some combination thereof. But rather than a tale of woe and hardship, Transcendental Youth extols the persistence of this group of outcasts, examining the human quest for meaning and the constant pushing of limits. Compositionally, Transcendental Youth has Darnielle continuing in the lush, full direction he’s favored on the last few LPs. This time though,The Mountain Goats are particularly brass-happy. Contagious, triumphant horn arrangements bolster tracks like “Cry For Judas,” while their softer, more mournful counterparts strengthen the emotional impact of “White Cedar” and “In Memory of Satan.” Of course, it wouldn’t be a Mountain Goats album without a couple of thrilling literary songs, and “Amy aka Spent Gladiator” and “The Diaz Brothers” fill this quota phenomenally. 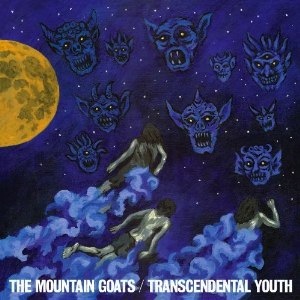 Transcendental Youth proves that, like some fine prosaic wine, The Mountain Goats only improve with age. In the 21 years since Darnielle’s first performance under the moniker, the band has evolved from a brilliantly poetic one-man show to a full-fledged indie folk force. The gut-wrenching honesty and captivating storytelling are still present, but they’re now accompanied by an acute understanding of instrumentation.